This morning, it was reported that SGX Listed Hyflux, Singapore’s prominent water treatment firm, is considering to seek court protection to facilitate negotiations with creditors. Hyflux wasn’t in a good position. Hasn’t been for a long time. While it is one of the poster child for the government, investors have not taken a liking to the company. And it is not hard to tell why. When you look at the balance sheets, income statement, it does not give you good account that you should further explore this business. However, what is appealing is its perpetual securities and preference shares. 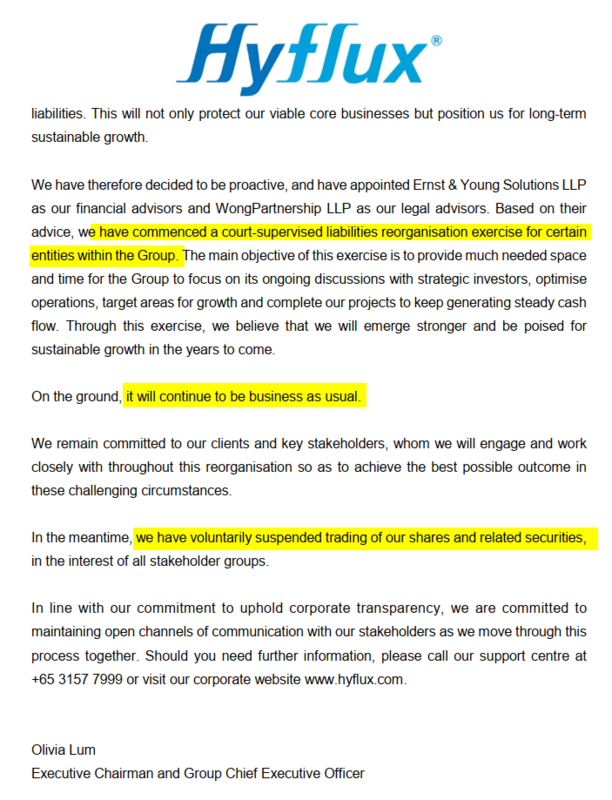 Hyflux has high debt, a business that is not cash flowing for some time, and people question whether they will default on its perpetual securities and preference shares payment. They are indeed appealing as they are far below par value, and give a very high yield, should Hyflux be able to avert their debt issues. For that to happen, they would have to find some ways to sell of 70% of Tuasspring, a water desalination and power plant. This evening, Hyflux made an announcement that they have voluntarily suspended trading of their shares and related securities. They could have sold the TuaSpring stake but it is likely that people are vulturing to get it at perhaps a cheap price. As I said the 6% perpetual securities were damn appealing rewards wise. The above chart is the performance chart, which factors in the dividend payments. Without the dividend payment the price chart would be closer to 50 than 60. 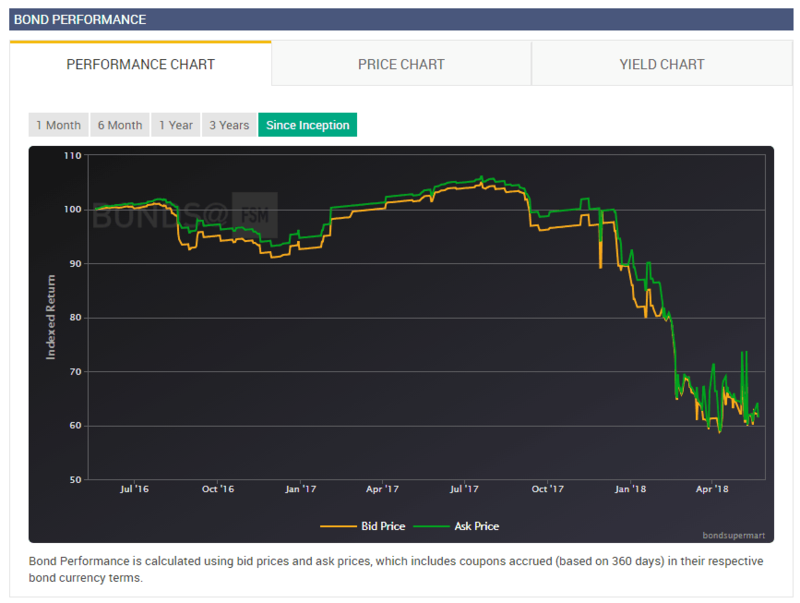 As it is almost half the price the yield of 6% nearly doubled. 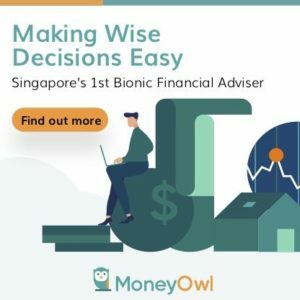 As of this article the yield to maturity is 12.3%. As part of the reorganization process, Hyflux will be conserving its cash and only make critical payments to continue operations. Thus, they will not be making the upcoming coupon payments due on 28th May 2018. Perhaps, when things get better they will restart the dividend. While we are on this topic, be careful of high yield. The yield is attractive because in some cases the business will not stop. In some cases the business will stop. Investors tend to blindly chase yield, and be risk seeking and basing on hope instead of feeling safe. There are some potential train collisions that we could see coming. Some Industrial REIT managers see the upside of boosting their asset under management, and perhaps hope for the best when it comes to some of the sale and leaseback deals. Most believe that upfront rental security deposits are adequate for them to take on risk tenants. Soilbuild Business Space‘s tenant Technics Oil and Gas defaulted during the recent oil and gas downturn. While not a REIT, Boustead Project‘s tenant Ausgroup also defaulted. Both depend on the security deposits to tide over 1 year. 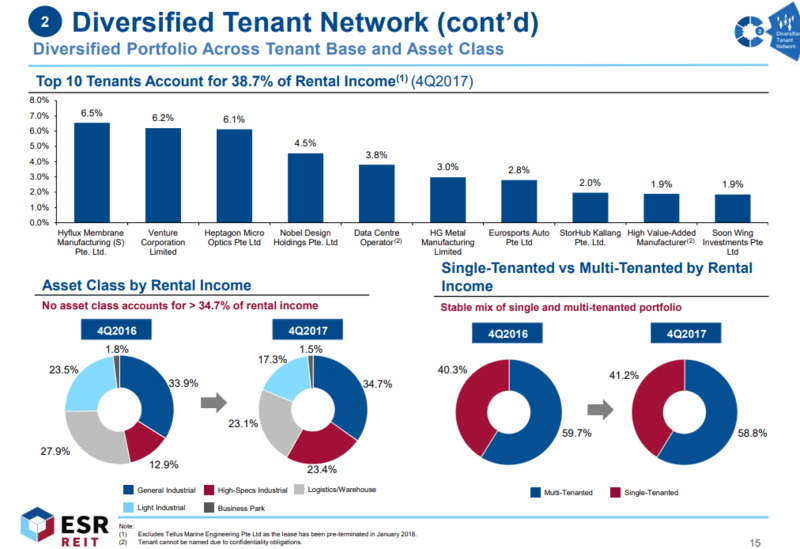 The bigger question is could they lease out the sale and leaseback properties to a new tenant fast, and at a rate close to the passing rent? Last we know, the Ausgroup property is still un-leased. In October 2017, ESR REIT, after E-Shang took over, made their first acquisition with a $111 mil acquisition of 8 Tuas South Lane. The net property income generated would contribute more than 6.5% of existing net property income. This happens to be their largest tenant. The property is near Singapore’s future global port and international maritime hub, the Tuas Megaport, which will be the world’s largest container terminal. This port will open progressively in 2021. The property is leased to Hyflux under a 15 year master lease. The land lease of this place is 20 years with the option to extend for 15 years. Now what happens if Hyflux cannot operate as a business anymore? Would this be a major tenant default? Whenever, the REIT manager makes an acquisition, divestment, AEI decision, it gives us a chance to assess the manager. We thought ESR would be savvier than this. Cambridge Industrial Trust’s shareholders would hope to have a savvier manager. Now we wonder if they really know what they are doing. Perhaps time will prove me wrong. The shareholders of Viva Industrial Trust, whom are merging with ESR REIT would take note of this. The merger might turn out to be timely, as in the event of Hyflux default, the merger would soften the blow. I will file this as something to remind myself of the strength of the manager. Quote: “Logistics, warehouse operators and manufacturers located near the megaport are expected to benefit from faster turnaround time. The transformation of the Tuas area for port development is also expected to increase the attractiveness of the Property to enjoy upside potential,” ESR-REIT said. It wants to tap on its proximity to the future Tuas Megaport. ESR-REIT will buy 8 Tuas South Lane from Hyflux Membrane Manufacturing Singapore Pte. Ltd. (Hyflux) for $95m. According to an announcement, ESR-REIT wants to tap on the property’s proximity to the future Tuas Megaport, which is expected to be the largest container terminal globally. “Logistics, warehouse operators and manufacturers located near the megaport are expected to benefit from faster turnaround time. The transformation of the Tuas area for port development is also expected to increase the attractiveness of the Property to enjoy upside potential,” ESR-REIT said. 8 Tuas South Lane has five detached factories, one block of eight-storey warehouse and four blocks of dormitory buildings. It has a gross floor area (GFA) of 72,569 sqm and a remaining land tenure of 20 years. Hyflux will leaseback a majority of the space for 15 years once the acquisition is completed. Hi Tony, either you are an insider in ESR REIT or you are very optimistic. Time will tell. If u read ESR announcement carefully.. they bought the land becos of the upcoming Tuas Megaport and the potential appreciation in value of the property. So Hyflux bankrupt maybe is a short term pain.. long term the land is a goldmine , dun think ESR Reits deserves the bashing. 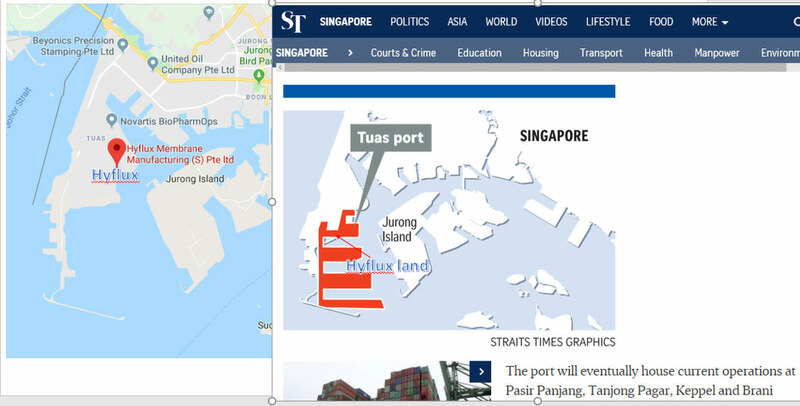 Maybe they already know Hyflux is facing problem and know that Hyflux is desperate to sell that parcel of land, that’s why they buy the land from Hyflux knowing even if Hyflux folds, the land value will appreciate or will find new tenant with higher rental yield as the Tuas Megaport hots up. You do realize the land lease is 20 years…..
Ok my bad I realize the land lease there is an extension of 35 years. 35 years lease.,.. not 20 years.. so that piece of land is a goldmine considering Tuas Megaport starts operation in 2021..
Nice article, very informative. I am a VIT unitholder but I am not a fan of the ESR manager. I will probably sell out once the merger goes through. Hyflux piece of land bought by ESR Reits is a goldmine. I think this can be a lesson for REITs as well. To avoid leverage in a environment where it would be tough to refinance the loans.